« Where to Stash your CASH in this Market! This entry was posted on April 11, 2008 at 11:51 am and is filed under Vitality. You can follow any responses to this entry through the RSS 2.0 feed. You can leave a response, or trackback from your own site. 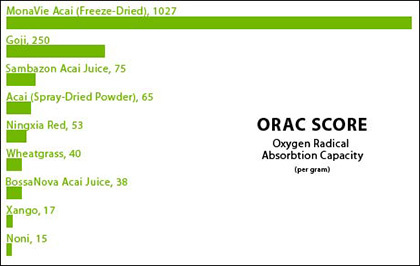 If it’s ORAC score you want from the Acai, you’re much better off getting an Acai supplement – the freeze-driec variety – as these have even higher ORAC scores than the Acai juices. Please let me know where I can purchase this product. I want to avoid being scamed and would like the pure product.